Does Telenor Really Hear You? Did a hunger pang just cross your belly? Don’t just be ready to gobble down a whole food counter, but just hop in your car, start the engine and speed off to your nearest Burger King outlet and satiate your gluttony with their latest range of ‘The King’s Collection’ with huge, juicy tender chicken & beef burgers, laiden with their special ‘red king sauce’. This amazing new addition on the menu was made a few weeks ago and I happened to be one of the lucky ones to try it on its launch day. Food is never fun without laughter and a bunch of folks to chit chat with, hence a host of food tasters, bloggers & social media influencers were invited to try and review the delectable addition. we sat in a large group and waited for the ‘King’ to arrive, meanwhile chatting and talking about the gathering on Twitter with the suggested hashtag of #KingsCollection and as the meal arrived, a roaring chant of “All hail the king” was made followed by complete silence as everyone got busy in savouring the taste of the new range. Once, the feast was devoured, the tweeting and chatting resumed. Clearly, the mood becomes light and happy when you have had good food, the same happened with us too. 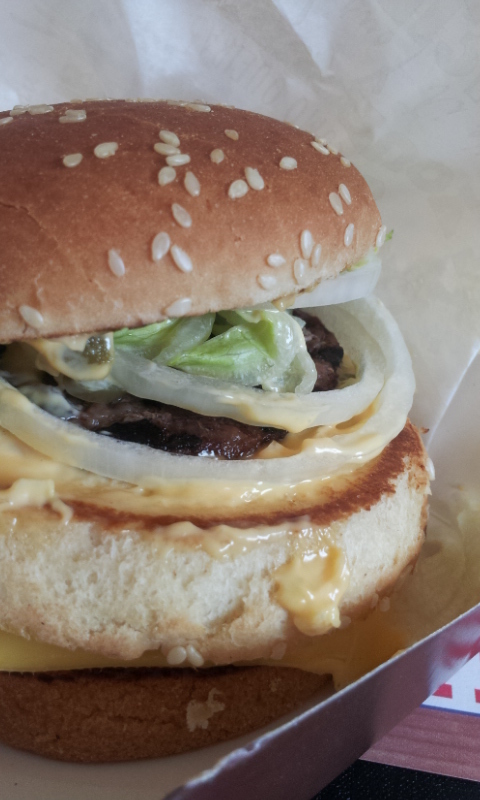 Look at that double – pattied beauty, doesn’t it make you ravenous already?? So if you still haven’t tried out this first class meal fit for a King’s paunch.. you better hurry up! Grab your meal now! Next Next post: The Magnum-ous Event..